I’ve got all the dolls now, they’re all so cute! It’s amazing to see how different the dolls can be since they’re all created on the same pattern. They’ll be hung tommorrow, so I’ll take some photos then. But one of the ladies bought in Semolina Cake for the last day, and it was really tasty. So I asked for the recipe. Boil the milk, semolina and sugar for a little while, stirring constantly. Pour into a shallow dish and set in the fridge overnight. The next morning, make up some jelly and pour it over the set semolina. 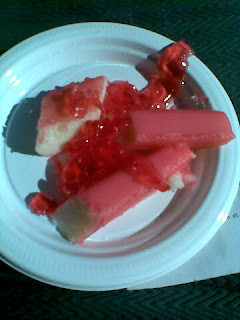 There was also suggestion of fruit in the jelly, or nuts on top. I was send home with several more pieces, which you can see on the right. They fell over on the plate before I photographed it thou. Rest assured it was much prettier before! Next post: more Halloween mentions!